Luxury Villa in Peyia, Paphos – This beautifully presented 3 bedroom luxury home is situated on a 1043 sqm plot in a well established residential cul-de-sac close to the prestigious site of Sea Caves, Coral Bay and the Akamas National Park. For those looking for a luxury villa in Peyia in a more rural setting and yet not far from the amenities, this is an ideal location. The property has contemporary style finishes throughout and has recently been renovated to an excellent standard using good quality modern finishes. Designed as a permanent home, it has many extras including air conditioning, solar reflective fly screens, water softener/purification system, partial double glazing, aluminium shutters, pressurised water, solar panels, alarm and security lighting and much more. The ground floor accommodation features a spacious open plan living area with corner fireplace, dining area, large kitchen, guest toilet and utility room. The newly fitted stylish kitchen has high quality units, granite worktops, American style fridge/freezer, built in oven, gas hob and cooker hood, microwave, dishwasher and island breakfast bar. Sliding patio doors lead from the dining and lounge areas to a large covered terrace and comfortable seating area overlooking the large 10m x 5m swimming pool and beautifully landscaped gardens. A terrazzo staircase leads upstairs to a particularly spacious master bedroom with ensuite shower room and walk in dressing area, second double bedroom with en-suite shower room, third double bedroom and family size bathroom. A large corner balcony with glass balustrade off the master bedroom is a wonderful place to sit and enjoy the wonderful sea views and magnificent sunsets. The outside area is extensive and features many different areas to enjoy. The gardens have been landscaped with low maintenance in mind and include a herb garden, mature olive tree and many varieties of fruit trees such as lime, mandarin, orange, lemon and passion fruit. A pergola near the pool provides a wonderful shaded area for relaxing and for outdoor entertaining there is a purpose built outdoor Cyprus kitchen BBQ and bar area. The gated driveway has a car port to the rear and parking space for at least four cars. 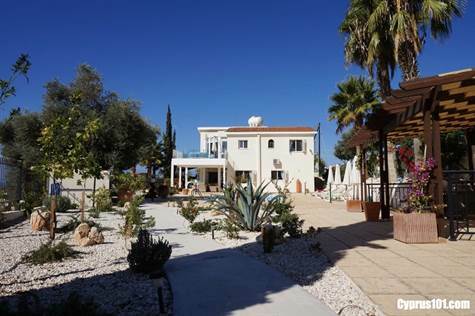 Luxury villa in Peyia Property information here.